In the spring of 2009, Mark Parkinson, then governor of Kansas, was considering a request from Sunflower Electric to build a new coal-fired generator in Holcomb, a small town in the western half of the state. Parkinson, eager to draw more wind developers to Kansas, said he would authorize the project if Sunflower backed a plan to source 20 percent of the state’s electricity from renewables by 2020. From the outset, it sounded like a fair bargain. Sunflower would get its coal plant, and Parkinson could begin the slow, arduous and costly work of revamping the state’s electric grid. Over the next few years, the cost of renewable energy plummeted. Kansas blew past its renewable energy target and now generates 30 percent of its electricity from wind. And the Sunflower coal plant? It has yet to be built. High costs and legal challenges have kept the project in limbo. Wind and solar are now cheap enough to compete with coal and gas across much of the country — even without subsidies. Fossil fuels once had little to fear from renewable energy, but that’s no longer the case. Last year, wind and solar made up two-thirds of new U.S. generating capacity. Today, wind technician and solar installer rank among the fastest-growing jobs in the United States. But, falling costs and soaring popularity won’t be enough to sustain renewables. Clean energy has reached an inflection point. It threatens to upend the status quo, and entrenched interests are fighting back. The rise of wind and solar threaten to eat away at oil and gas profits. New rooftop solar installations are cutting into the core business of power utilities by allowing homeowners to generate their own electricity. And new wind farms are transforming landscapes, sparking backlash from environmentalists. Where wind and solar have made inroads, energy companies, power utilities and conservationists have pushed legislators to pass onerous, byzantine policies that make it all but impossible for renewables to compete with conventional power plants. These measures are having a tangible impact on regular people. Ohio severely restricted wind development, depriving schools of tax revenue from nearby wind farms. Indiana slashed incentives for rooftop solar, dealing a blow to homeowners and installers. Policymakers across the country are pushing measures to stifle renewable energy, and an unlikely assortment of consumer advocates and business leaders is fighting back. The fight over clean energy is no longer a conflict between left-leaning climate hawks and laissez-faire libertarians. These battles are pitting mainstream Republicans against Tea Party conservatives and environmentalists against each other. Wind and solar have scrambled ideological loyalties, forcing Americans on both sides of the aisle to rethink their definition of the “free market” and reconsider what it means to serve the public interest. There’s the Wyoming you see on postcards — the snow-dusted mountains and caramel-colored prairies where movie stars build their second homes. But there’s another Wyoming — the one that powers America’s homes and businesses. The Cowboy State churns out more coal than all of Appalachia, and it’s home to some of the strongest winds on the continent. The Rocky Mountains funnel air across flat, open prairies, producing winds that rival the most powerful ocean gales. In Carbon County, Wyoming — so named for its abundant reserves of coal — conservative billionaire Philip Anschutz is building the country’s largest wind farm. Its 1,000 turbines could generate enough electricity to power every home in Los Angeles and San Francisco — electricity that will be shipped to California by way of a brand new 700-mile transmission line. Anschutz, who owns the conservative news outlets The Weekly Standard and The Washington Examiner, has given millions to Republican politicians. But, despite his political leanings, and the promise of hundreds of construction jobs in Carbon County, his project — and others like it — have faced persistent headwinds in the Republican-dominated state legislature. Earlier this year, legislators tried to prevent Wyoming utilities from selling wind power. The bill went nowhere, but it points to an undercurrent of hostility toward wind. Wyoming is currently the only state to tax wind power, and legislators have pushed to raise the wind tax from $1 per megawatt hour to $3 or $5. Anschutz’s business fought both proposed tax hikes, which died in committee. Madden, like his colleagues, is trying to fill a hole in the state budget. Wyoming has no income tax. Oil, gas and coal royalties supply most of the state’s revenue. Now, coal is in decline. Consumption is waning, and workers are losing their jobs. This has produced a budget shortfall for which there is no easy fix. Under the current system, Wyoming effectively imports its tax revenue. Most coal is shipped to power plants out of state, meaning ratepayers in Texas, California and elsewhere pay the tax on coal. If you buy electricity from a power plant anywhere in the United States that burns Wyoming coal, you are helping to put Wyoming teachers in Wyoming schools and lay Wyoming asphalt on Wyoming roads. In recent years, falling demand for coal has starved the state of essential revenue. Legislators need to fill the budget gap, but there is little interest in imposing an income tax. So they are slashing expenditures and looking to other sources of revenue. Together, Wyoming’s powerful winds and budget woes have produced a peculiar cast of characters — in Anschutz, a conservative media magnate pushing for renewable energy, and in Madden, a pugnacious libertarian furiously trying to raise taxes. Madden is nothing if not consistent, and his approach to tax policy would strike many as reasonable. But experts warn against raising the wind tax at a time when the state is trying to attract developers and create new jobs. Wind is a multi-billion dollar opportunity for Wyoming. Anschutz’s wind farm and transmission line come with an $8 billion price tag. Renewable energy developer Viridis Eolia is building a $3 billion wind project. And Rocky Mountain Power is spending $3 billion in Wyoming on another wind farm and transmission line. Notably, Wyoming’s attitudes toward wind are about more than just money. Many in the Cowboy State see turbines as a blight on the landscape. Wyoming is defined by its jagged mountains and open prairies. Wind farms threaten to mar its most treasured vistas. Of course, attitudes may change. Wind turbines, now regarded as an eyesore, may come to represent industry, security and prosperity. To that end, Godby said legislators should leverage tax policy to attract more wind jobs. Wyoming finds itself in an unusual place. Nationwide, the shift to clean energy will likely create millions of jobs, but there will be winners and losers. Wind-rich Iowa will cash in on demand for cheap, low-carbon power, while coal-dependent West Virginia stands to lose more jobs than it gains. Wyoming straddles both sides of the energy divide. Coal from Wyoming’s Powder River Basin is among the cheapest and purest around. Decades from now, when the final shipment of American coal heads to the last remaining coal-fired power plant, it will depart from a Wyoming mine. Along the way, that train will pass some of the most productive wind farms in the country. Apparently, not everyone in Florida has gotten the memo. The state’s chief power regulator, Art Graham, told an audience at a 2014 hearing on solar power, “I think the whole ‘Sunshine State’ is just a license plate slogan.” Graham’s not alone. For years, state lawmakers have said “intermittent cloud cover” would make solar unworkable in Florida. And yet, Florida generates less solar energy than several far cloudier states, including Massachusetts, New York and New Jersey. When it comes to solar, policy is key. And there, Florida is sorely lacking. Florida’s big electric utilities are the major sunblock. The four largest investor-owned utilities — Florida Power and Light, Gulf Power Electric, Tampa Electric Company and Duke Energy — supply power to around 75 percent of Florida ratepayers. 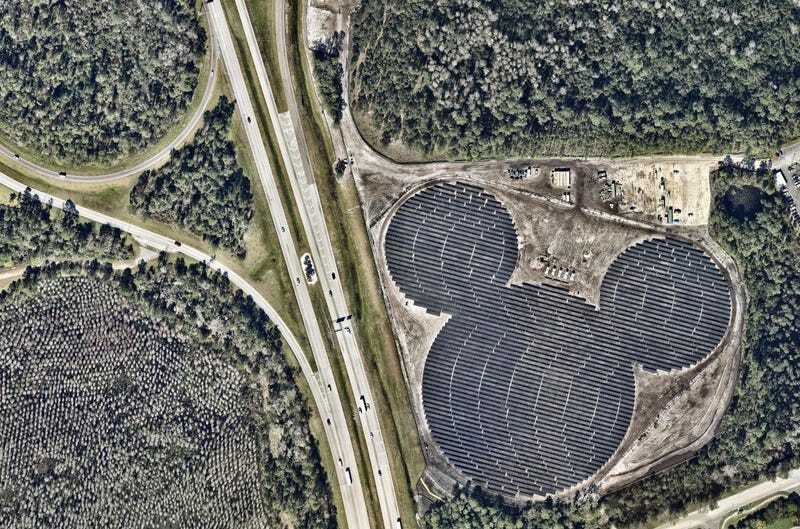 On your drive to Disney World, you might peer out your car window at the Mickey Mouse-shaped solar farm near Epcot. You would guess the array belongs to Disney, but you would be wrong. Disney merely owns the land under the installation. Duke Energy owns and operates the array, and sells the power it generates to the resort. Effectively, four companies control Florida’s power market, dictating how and at what price residents get their energy. Floridians generally don’t get to choose which power provider they use to run their homes. Clean energy advocates say Florida utilities wield outsized influence on state politics. Utilities rank among the largest campaign donors in Florida politics. A 2014 report from watchdog group Integrity Florida found that the state’s four utilities spent more than $12 million on lobbying between 2007 and 2013, registering at least one lobbyist for every two legislators each year during that period. Utilities also enjoy an unusually close relationship with the government. The Integrity Florida report details a “revolving door” between power companies and regulators. And it finds that the Public Service Commission, including regulators like Graham, “routinely side with” utilities over consumers. But the tide is beginning to shift. Utilities now face opposition from an unlikely source. In the spring of 2014, Perfetti and Debbie Dooley recruited Tea Party activists and influential Florida conservatives to join a new pro-solar advocacy group, Floridians for Solar Choice. Dooley and Perfetti united libertarians and pro-business trade groups with environmental organizations. Last year, they pushed to amend the state constitution to allow Floridians to sell solar power to their neighbors. Utilities put forward a competing amendment, known as Amendment 1, that could be used to raise fees on rooftop solar owners and block small solar farms from selling their power to consumers. The companies created an advocacy group, Consumers for Smart Solar, with funding from organizations connected to the Koch Brothers. While Floridians for Solar Choice failed to gathered enough signature to get their measure on the ballot, they nonetheless managed to demonstrate the broad support for solar. “The success of that effort, which created such noise and attention, put pressure and pushed the legislators” towards pro-solar policies, Glickman said. In response to these efforts, lawmakers created a ballot initiative that would amend the state constitution to waive property taxes on solar panels installed on homes and businesses. Amendment 4, as it was known, passed with 73 percent of the vote in August 2016. Amendment 1 would meet a different fate come November. The measure earned national coverage, most of it critical, and a series of gaffes plagued the campaign in its final weeks. A utility-friendly policy director was caught on tape praising the amendment’s deceptive language as “political jiu-jitsu,” while the Florida firefighter union publicly withdrew its support for the amendment days before the vote. Florida ultimately rejected the measure at the ballot box. “Talk about sending a message,” laughed Glickman. Despite their resounding defeat at the ballot box, utilities have continued to undermine solar. The legislature recently authored a bill implementing Amendment 4. In the first draft, Rep. Ray Rodrigues (R) snuck in language written by Florida Power and Light. The added text would have saddled solar companies with new financial disclosure requirements, but the Miami Herald exposed the move, and legislators cut the offending language from the final version of the bill. The updated rule will make it much harder for the state to hit its renewable energy targets. Vermont aims to build up to 750 megawatts of wind power as part of a plan to source 100 percent of the state’s electricity from renewables by 2050. There are 120 megawatts of wind power currently installed— and that was under the old rule. Disruptive technologies may face terrific backlash, but eventually low cost and convenience prevail. Computers replaced typewriters. Cassettes replaced records. Cars replaced horses. And none of it happened overnight. At the turn of the 20th century, most Americans thought of the automobile as a loud, costly, unreliable alternative to a horse. The country lacked paved streets and gas stations, and cars were prone to breaking down or crashing. The automobile was a toy for rich men willing to flirt with danger. For most everyone else, it was a terrible nuisance. In 1900, there were just 8,000 cars on the road. Then came Henry Ford, mass production and the Model T. By 1910, Americans owned some 470,000 cars. By 1920, a staggering 9.2 million. Opposition faded, and the automobile became a staple of American life. Today, there is a car in every garage, a gas station on every block, and millions of miles of roads and highways stretching from coast to coast. Unlike the automobile, clean energy is still in its adolescence, a period when falling costs and widespread adoption spur resistance from business leaders, policymakers and the public. But, in time, wind and solar will grow and mature, deliver more jobs, more tax revenue and smaller power bills. Like the automobile, they will become ubiquitous. Nexus Media is a syndicated newswire covering climate, energy, policy, art and culture. Owen Agnew, Josh Chamot, Jeremy Deaton, Josh Landis, Mina Lee, Monika Sharma, Laura A. Shepard and Molly Taft contributed to this report.